As a Workforce Planner I always get frustrated by almost every one’s insistence (especially government) that somehow the mining & energy sector will answer Australia’s unemployment concerns. Yet even after record FDI in recent year’s pre & post GFC these sectors continue to employ a very small percentile of Australians. Here are some analytics that highlight the minor role that mining & energy plays in employing Australians. I’ve also added some analytics which show the recent exponential growth in employment which goes some way to explain why some get so excited about the mining and energy stories. Figure 1: Total employed in the Mining & Energy sectors 1984-2012. Data sourced from the ABS, Aug 2012. Mining has risen to a record high 275,200 (but just 2.4% of total employment) while Energy has risen to 153,300 (1.3% total employment). The increase in mining employment over the past 10-years has been significant, from 81,200 to 275,200 (an increase of 338.9%). Energy has increased but not to the same scale, from 83,900 to 153,300 (an increase of 182.7%). It should be noted that the Energy figures also include water & waste services employment. Although the mining data is cleaner it would also contain some infrastructure contamination, so the true mining employment figure would be lower but this won’t be quantifiable until after the current FDI deployments start to wind down (currently forecast to commence declining from next year but continuing until 2016/2017). 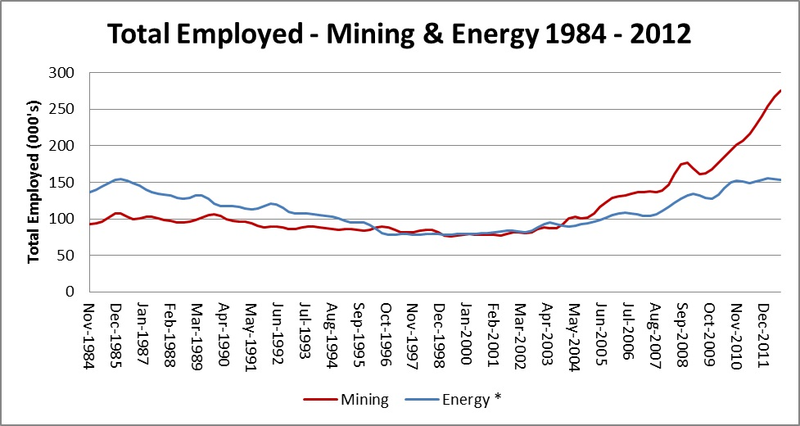 Figure 2: Changes in employment totals for the Mining & Energy sector 1985 – 2012. Data sourced from the ABS, Aug 2012. I spent a lot of time travelling throughout north Queensland in the early 1990’s, when gold was under $300 per oz. and a lot of coal and gold mines closed. This is reflected in the negative numbers through most of the 1987- 1999 period. From 2000 through to 2012 the data has all been largely positive. Just this year the mining sector has put on an impressive 42,800 averaged over the first three quarters. 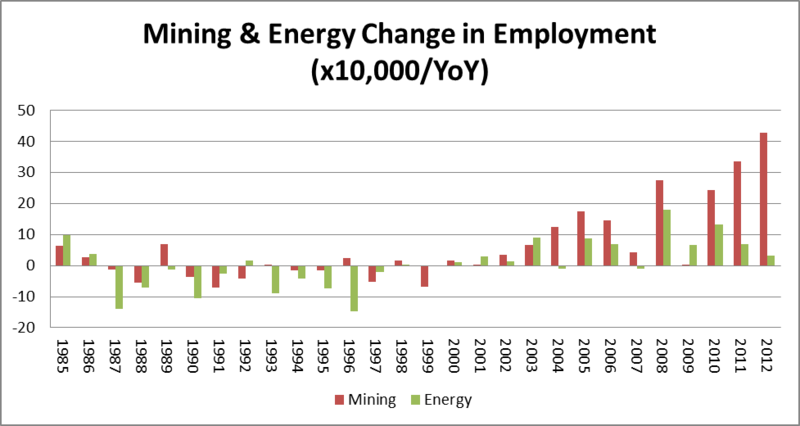 Take a note of how Energy and Mining have increased employment every year since 2010. Mining has increased by 24,200 (2010), 33,500 (2011) and 42,800 (2012) as mentioned previously. Energy (and water & waste services) has increased but in a declining fashion with 13,300, 6,900 & 3,300 over the same period. Although not included in this data set I have been doing a Mining environment scan which has shown an increase in negative employment stories for both sectors. This should mean the first significant decrease in employment in these sectors come November. 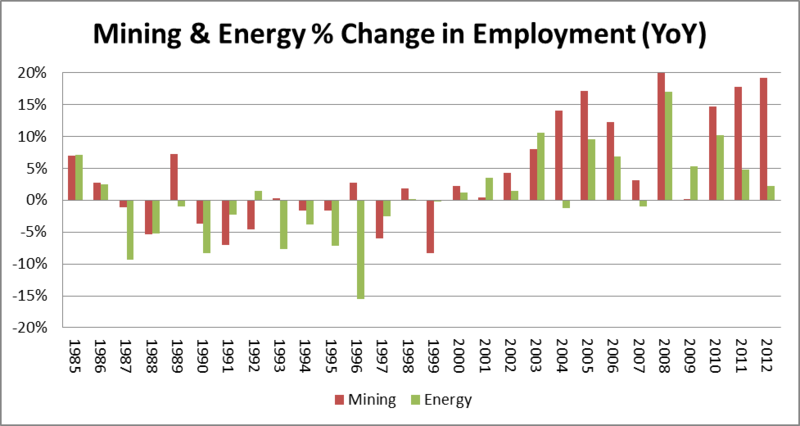 Figure 3: Changes in employment percentiles for the Mining & Energy sector 1985 – 2012. Data sourced from the ABS, Aug 2012. The last graph looks at the same data as represented by Figure 2 but looks at increases and decreases in sector employment as a percentile. This is one of the key reasons why so many politicians and policy makers have been sold the mining & energy sector employment myth. Even though the percentiles are impressive, with Mining averaging 11.9% increase over the past decade (13% if you remove 2009) it all comes off a very low base and is highly susceptible to commodity price movements as recent events have highlighted. The main point here is that although mining and energy have been the boom sectors of recent years they still only employ 428,500 people or just 3.7% of the working population, although this figure is on the high side and would reduce once you factor data contamination and non-energy sector job categories. Given the recent commodity normalisation that has been occurring and other factors including (but not limited to) redeployment of FDI to other global suppliers, deferral of projects due to high CAPEX, overcapacity and a move to automation & augmentation in high-cost countries the mining & energy sectors are not going to supply the large scale employment increases many commentators, politicians and policy makers have suggested.